Though they're often dubbed "Jewish wontons," kreplach have their own place in the worldwide canon of filled dumplings. An Ashkenazi specialty, they're more closely related to Eastern European comfort fare like pierogi. Kreplach are typically filled with meat, chicken or cheese, or, less commonly with potatoes or kasha. Here, they go vegetarian, with a filling of roasted mashed sweet potato flecked with savory sauteed onions and mushrooms. They're delicious served in soup broth, or simply tossed in butter and topped with sour cream and herbs. 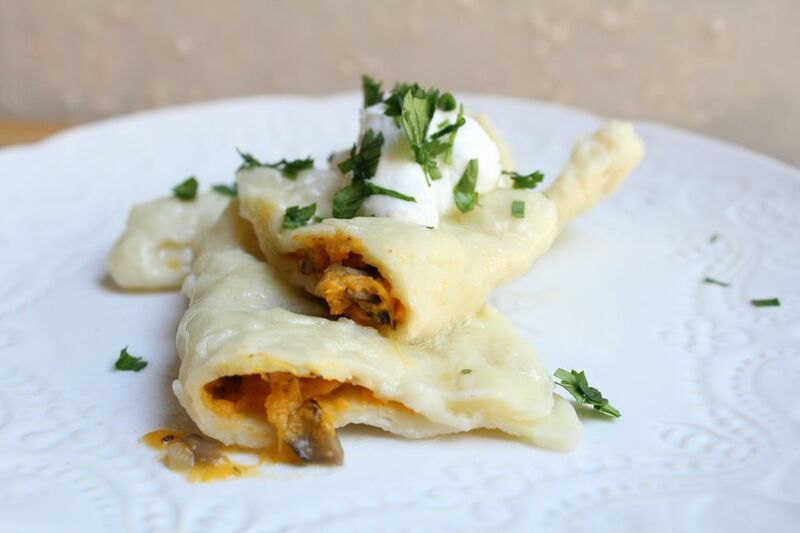 What to Do with Leftover Filling: Depending on how thin you roll out your dough -- and, consequently, how many kreplach you're able to make -- you may have extra filling. Warm it in the oven for a simple side. Or spread it over pizza dough, top with a sprinkling grated mozzarella or crumbled goat cheese and Parmesan, drizzle with a little olive oil, and bake at 425 F until the crust is crisp on the bottom and the cheese is melted. Prick the sweet potato all over with a fork, rub the skin with a little oil, and place on a foil or parchment-lined pan. Bake in the preheated oven for about 45 minutes, or until soft. When the sweet potato is cool enough to handle, remove the skin and transfer the flesh into a large bowl. Mash well with a fork. In a large skillet or chef's pan set over medium-high heat, warm the oil. Add the onion and saute until soft and translucent, about 3 to 5 minutes. Add the mushrooms and a pinch of salt, and saute until the mushrooms soften and release their juices. Continue cooking until the the liquid in the pan has mostly evaporated, about 5 minutes more. Add the mushrooms to the sweet potatoes and mix well. Season to taste with freshly ground pepper. In a medium bowl, lightly beat the eggs, oil, and water. Make a well in the center of the flour and pour in the egg mixture. Using a fork, begin stirring the eggs, slowly incorporating the flour into the mixture. Keep stirring until the eggs and flour are well mixed and begin to form a soft dough (when the dough gets too thick for the fork, you can mix it with clean hands). Continue kneading for 5 to 7 minutes, or until the dough is soft and supple. Return the dough to the bowl, cover, and allow it to rest for at least 30 minutes. Put a little water in a small dish and set aside. After the dough has rested, divide it in half. On a lightly floured surface, pat one portion of dough into a rectangular shape. Using a pizza cutter, pasta wheel, or sharp knife, cut the dough into 2 to 2 1/2-inch squares. Put 1 teaspoon of the sweet potato-mushroom filling in the center of each dough square. Dip a finger in the dish of water, and "paint" the water along 2 adjacent sides of each dough square -- this will help seal the kreplach. Carefully fold the dough over the filling, so that you have a triangular package. Press along the sides of the dough to seal, making sure to squeeze out any air. Transfer the kreplach to the baking sheet in a single layer and cover with a clean tea towel so they don't dry out as you work. Continue making kreplach with the remaining dough and filling. If you'd like to store the kreplach for later use, you can freeze them now; place the baking sheet in the freezer, and freeze until they are firm, about 40 minutes. Transfer to a zip-top freezer bag and freeze for up to 3 months. Do not defrost before cooking. Carefully slip the kreplach into the water, stir gently once or twice to keep them from sticking to the bottom, and cook, uncovered, for 20 minutes, or until they float to the top and are cooked through. Serve in hot soup broth, or tossed in butter with a dollop of sour cream and a sprinkling of fresh chopped herbs. How Much Lox Do You Need for the Perfect Bagel Brunch?